UOB One Account Challenges OCBC 360 with 2% and 3.33% interest. How they stack up. Banks need money and seems the slowest of them all, UOB seems to be finally waking up to try to wrestle some of our deposits over. The unanimous winner have been OCBC with their 360 account, which provides up to 3% interest if you do 3 things with them. However since Apr 2015 this year, OCBC have make it more difficult to earn this 3% with more clauses. It is a good opportunity for UOB to prey upon our hurt and hate by offering their new UOB ONE Account. The UOB One Account looks to offer us up to 2% and 3.33% interest for up to $50,000 in 12 months if we bank with them. To earn up to 2% interest, you can just spend at least $500 every month on the UOB One card for 12 months. 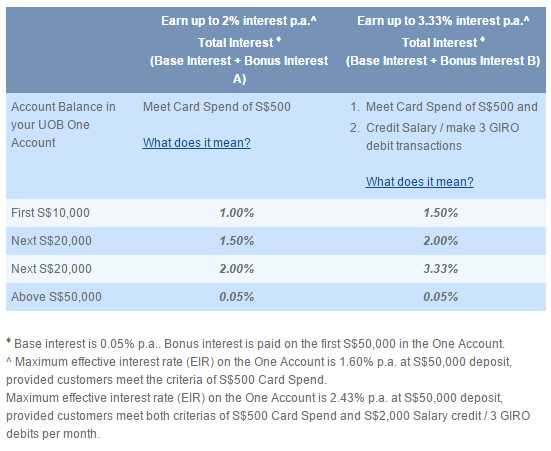 to earn up to 3.33% interest, you need to spend on the UOB One Card AND make at least a $2k salary credit or make 3 GIRO debt payments. 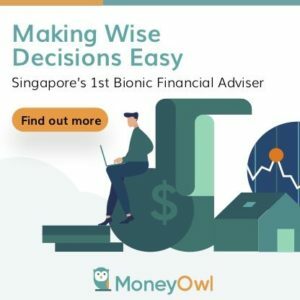 If you have less than $10k or at most $10k, yet able to meet the requirements on both sides, you can at most hit 1% or 1.5% interest on your deposit, however with the OCBC 360 you can hit 2%. The cut off point when you are able to satisfy all the requirements seem to be at $35,000 where your UOB One Account will earn $716 versus $700 with the OCBC 360 account. My initial thoughts are picking and choosing is better, but it seems if you have $50,000 or less, it is better to stick to one bank instead of mixing them up. However, if you have $100,000 and satisfy all requirements, you can take advantage of both sides. I felt the strength of UOB One is that if you have $50,000, you can earn $800 from the credit card alone versus $250 with the OCBC 360. If you have more spending and GIRO payments, and you have $100,000, you stand to enjoy the greatest benefit as you can satisfy OCBC 360 AND UOB ONE max requirement since for UOB ONE max requirement, salary credit is not mandatory. So will you look to switch, mix and match with this UOB Competitive offering? Do let me know. Hi, can you elaborate your working on “Pay @ OCBC360, Credit Card and Payment @UOB One” and “Pay and Payment @ OCBC, Credit Card @ UOB One”? Thanks. Pay @ OCBC360, Credit Card and Payment @UOB One means the sum of money is split between $25,000 in OCBC 360 and $25,000 in UOB One, where the former you have salary credited to the account and the latter have a credit card charge to it and 3 payments paid using the account. Actually, can we just use both ocbc and uob to make payment for the same 3 bills? Ah yes Dave, thanks for clearing it up. That means you cannot use it to pay other credit card bills. Hi Eric, I think this we have to call in and check. You mean pay half with OCBC half with UOB? hmm…. Nice post as usual 😉 I think the OCBC 365 is a lot better than the UOB ONE card but its tempting to switch my credit card spending from OCBC to UOB in view of the extra interest. With 100k, i think its worthwhile considering both accounts as you mentioned. Currently, I just spend around $5 on other random credit cards to gain extra GIRO payments so it would not be hard to hit 6 bills (with Tax, phone bills). But I think I will still wait for OCBC’s further clauses as well as the Singapore Savings Bond before I make a decision. But for those with SCB’s Bonus saver, it might be worth switching to UOB considering higher interest and 50k cap vs 25k cap. PS Under the last point in the summary, i believe OCBC 365’s online rebate is only 3%. 6% is for weekend dining. FRANK card has 6% for online spending. The Frank card is quite special in its 6% online spending. I am not sure how to clock 6% for the full $500 bucks. Kyith, there are new updates to both SCB BonuSaver and OCBC 360 as of today 30 Apr 15. It warrants a update on this post, especially for those who are unable to credit their salary. Earning bonus interest isn’t getting any simpler with more conditions and clauses inserted along the way. Hi Kyith, I was curious about the difference in UOB ONE vs OCBC 360 so I made a graph below, comparing 2.2% of OCBC 360, with minimum spending, Salary crediting and 3 bills payment to tier-ed UOB interest with minimum spending and salary crediting. The window where UOB ONE account gives more interest vs OCBC 360 actually starts at 40k, and ends around 56k. So, if a person is expecting the bank balance to remain within the window, UOB is better, otherwise, going lower or higher, OCBC is better. Thanks for dissecting. Perhaps the difference is less than significant. Basically even if you have $35,000 in UOB ONE account but didn’t manage to meet the most basic criteria – to spend $500 via credit card, you will get 0% interest. Unlike OCBC 360, if you meet other criterias – salary input and 3 GIROS, which are also the easiest, you will still get 1.2% + 0.5% = 1.7%. Think about it. Will you spend $500 every month where your GIROS payments are already well-taken off? Even if you force wallet to hit that quota, is the rebates worth more than when you spend less? This is something we need to balance out. The hurdles for the two plans caters for different folks. I can see folks finding it easier to satisfy the credit card hurdle and earning based on that, considering if they have the full sum of $50,000 they earn a good sum. Still I subscribe to your methods, and to be fair the banks have to differentiate.